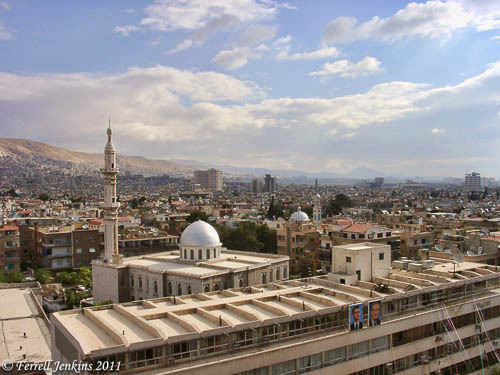 Damascus is one of the oldest continuously inhabited cities mentioned in the Bible. It is mentioned no less than 60 times. Syria is mentioned a few times more. Abraham went north of Damascus to rescue lot from the Mesopotamian kings (Genesis 14). He named (or considered?) Eliezer of Damascus as his heir (Genesis 15:2). I think it is most likely that Abraham, and the other patriarchs, traveled through Damascus on their way to the promised land. The city continued to be important in biblical history during the time of the United and Divided Kingdoms of Israel and even to New Testament times (think conversion of Saul, Acts 9). This photo was made from my hotel window in Damascus. The view is to the west (left side of photo) and north (right side of photo). Damascus is built against the Anti-Lebanon mountains on the west. The desert on the east of the city stretches to the Euphrates River. Note two of the ever present photos of the young president Asad and his father on the building at the bottom of the photo. Damascus. View west and north. Photo by Ferrell Jenkins 2002. Mount Hermon is in the Anti-Lebanon range a few miles south of Damascus. This entry was posted in Bible Places, Bible Study, Israel, New Testament, Old Testament, Photography, Travel and tagged Syria. Bookmark the permalink. hi nice blog,,but im already visit there,now im planning to visit rather than Cambodia or Vietnam next 2 months, does anyone know how to apply visa? I’m google around and came across http://www.evisaasia.com, does anyone try this website before? Is it reliable?